Read Accepting Unconditional Love and revisit this timeless motivational book in the years ahead! Rising up and living to a higher vibration can be difficult in our daily activities because we’re human and experiencing a multi-faceted life of emotions. You have to deal with people at work and practice patience in the long grocery store line! If you yearn for a practical way to connect to your deeper self and shift your focus, Accepting Unconditional Love is a book that guides you towards the divine. Illuminate your weaknesses and bring them to the light and step into your power and begin your journey of spiritual growth. Ruth Cherry is a gifted and sensitive writer. Through her wisdom and poignant self-disclosure readers are guided to accept and embrace the unconditional love of Spirit that is available to each of us. This is a book to read and re-read. An illuminating and powerful book. Ruth Cherry’s Accepting Unconditional Love lays open both the theory and the practice of opening oneself up to receive the wonderful gifts of Spirit. With sensitivity and joy, and full of healthful intentions, the author presents ways for the reader to develop a gracious and available inner state in order that Grace may reveal itself to any of us. Many of us are so busy with the outer trappings of life, we forget the one that we will be with from beginning to end: ourselves. Whether people-pleaser or climber of the ladder of (perceived) success, our focus is usually outer. Reading Ruth Cherry’s book, Accepting Unconditional Love is a wonderful way to stop, look, and shift your focus. The second part of the book contains one-line suggestions to coach us along the way to accept the unconditional love we all deserve. Ruth Cherry has a knack of making deep psycho-spiritual work accessible and available in a simple, straightforward way. She deftly weaves her personal spiritual experience into universal spiritual principles and practices. Dr. Ruth Cherry’s vibration-raising new book Accepting Unconditional Love sends us on an introspective journey to a new and vibrant relationship with Source. Part autobiography, part instruction manual, Accepting Unconditional Love gives the reader a glimpse into the possibilities that lie ahead through building a working relationship with the Divine. 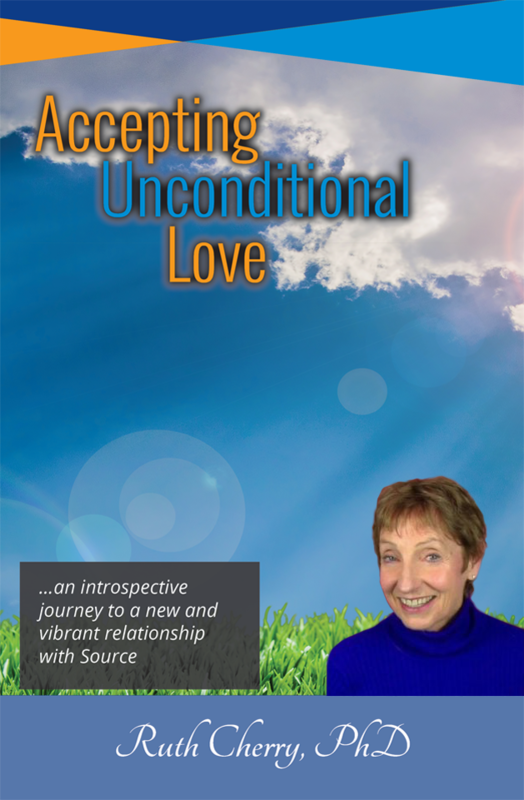 I highly recommend Ruth Cherry, PhD’s new book entitled Accepting Unconditional Love. I view this master work as a transformational course in Healing. It is written in a stream of consciousness manner in which we are gently escorted with unconditional love to enter our own psyche for self discovery. Dr. Cherry intertwines her own healing journey from MS to assist the reader as she has numerous clients by examining subpersonalities and resistance to living in the flow of life. This is a book to underline, review and practice the golden nuggets of wisdom to utimately make new choices to embrace our own soul.